Marinated Steak, served with a spicy Tomato Salsa, great for summer. In a small bowl whisk the marinade ingredients. Place the steaks in a large, resealable plastic bag and pour in the marinade. Press the air out of the bag and seal tightly. Turn the bag to distribute the marinade, place in a bowl, and refrigerate for 1 hour. Prepare the braai for direct cooking over high heat 230°–290°C (450°–550°F). Brush the cooking grates clean. Brush the onion slices with oil, and braai them, along with the chillies and pepper, over direct high heat, with the lid closed as much as possible, until the onions are tender and the peppers are blackened and blistered all over, 8–12 minutes, turning occasionally. Place the chillies and yellow pepper in a bowl and cover with clingfilm to trap the steam. Set aside for at least 10 minutes. Remove the steaks from the bag and discard the marinade. 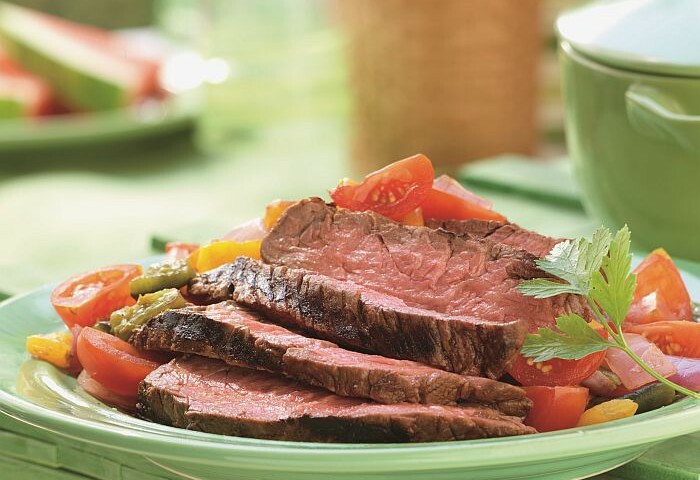 Allow the steaks to stand at room temperature for 15– 30 minutes before cooking.